Do you, like me, find yourself regularly turning to the obituaries in the newspaper? No matter what world, national or local events might have my attention that particular day in the newspaper, I always find myself checking the obituaries. Scanning the names and photos, I look for people I’ve known, might have met or heard about. Inevitably, I end up reading most of them – regardless whether or not I had any connection to them. I find fascinating the stories, memories, personal histories and linkages with family and community. The heartbreaking stories of loss, celebrations of lives lived and how we memorialize and remember our loved ones has always intrigued me. Over the last while, staff in the Grace Schmidt Room have been thinking about how obituaries connect and fascinate us all. For genealogists, obituaries unlock family relationships, histories and personal stories and open new avenues of research and discovery. To the local historian, an obituary provides personal signposts to a community story or chapter of history. The lack of indexing for historical obituaries has frustrated staff and researchers alike. To that end, I am happy to announce that we are launching a new volunteer project to undertake the creation of a searchable online index to obituaries in our local newspapers. We’re looking for volunteers who would like to scan obituaries from our newspaper microfilm collection, index the obituaries, and check the obituary indexing submitted by fellow volunteers. With the exception of the scanning work, volunteers will be able to work from home – we’ll send you digital files needed, including a data entry form. Completed indexing files will then be sent to a fact checker and returned to us for upload. If you are a regular obituary reader and are interested in indexing current editions of newspaper, please let us know when you apply. Information about the Obituary Indexing Project can be found here. If you are interested in applying, you can find the application form here. Our project will also include obituary related programs and events in the fall. Stay tuned to the blog for more details! 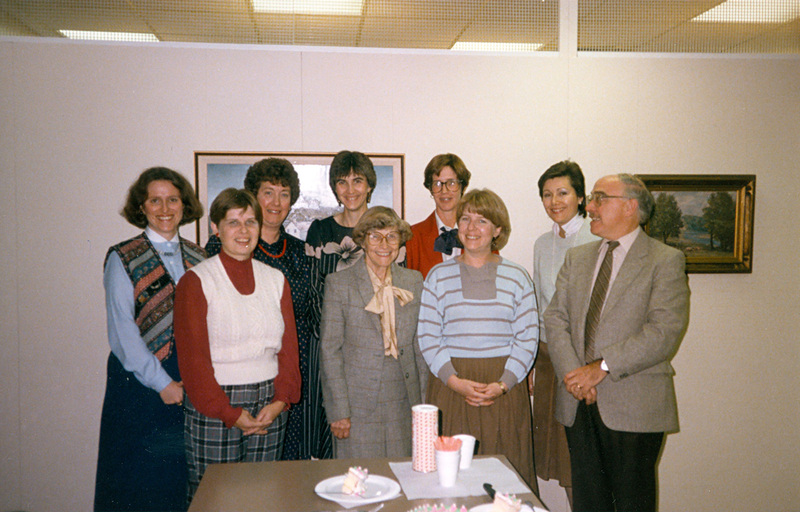 P010335 – KPL Chief Librarian, Lynn Matthews, far right, and GSR staff marking the 1st Anniversary of the Grace Schmidt Room, 14 October 1985. Pat Kauk is third person from the left. I am saddened to let everyone know that long-time GSR volunteer, Pat Kauk, has passed away. Pat was our transcriber of the Berliner Journal birth, marriage and death entries. Over many years, since her retirement nearly 15 years ago, she diligently worked away on translating the birth, marriage and death notices, along with other articles of interest, from the Berliner Journal. I cannot count the number of researchers, family historians and genealogists who have been helped by Pat’s translations – her work has been invaluable to understanding local families, businesses, events and people. I have very fond memories of my conversations with Pat – of her love of local history, pride and joy in her family and her fond memories of working with Susan Hoffman in the GSR. She was always happy to help people with their research and to let them know that she had worked in the GSR for many years. Staff in Information Services will also miss Pat and her frequent visits to the workroom to say ‘hello’ and to catch up on the latest news about happenings in the Library. Pat’s love of and passion for local history will be missed. She was a truly dedicated volunteer and I will miss her. You can find information about Pat’s memorial service here. Information about the photo above can be found here. While it may seem like it’s all quiet on the Library front, we have busily been working on uploading Soldier Information Cards to our online site. We are focussing on uploading the transcribed cards first as these can be processed quickly. As we are working on them, we have discovered that working on them while on a public desk is tricky – so we steal away precious moments off-desk to work on the cards. My co-workers regularly tell me how the cards, photographs and soldier stories have touched them – just as we have been heard from the Soldier Card Project volunteers as they worked on the cards. The tragic deaths of Corporal Nathan Cirillo and Warrant Officer Patrice Vincent in recent days remind all of the sacrifices that our military personnel make in defending our rights and freedoms. Adopted soldiers who have been researched will be the second set uploaded. 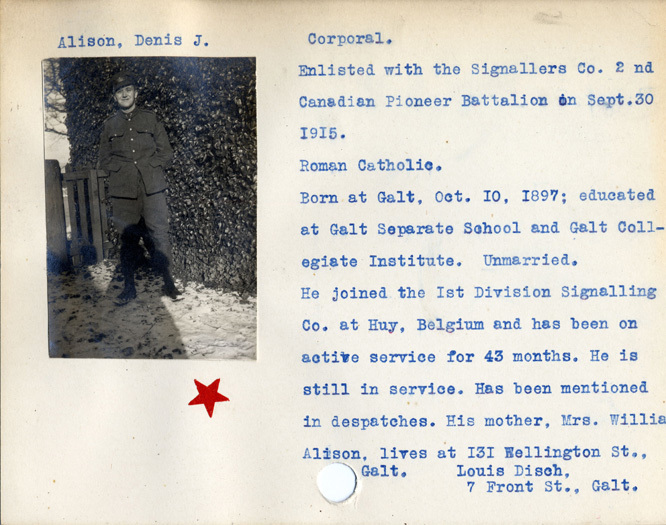 We have been discovering some of the unanswered questions about our little known and difficult to research soldiers may lie in the recently digitized WWI military service files now online at Library and Archives Canada. So it’s one step forward and a sometimes a couple steps back as new information comes to light. There are still those soldiers for whom nothing exists and we’ll be posting those online for anyone to comment or provide information. You may not be hearing regularly from Ingrid and Meghan about WWI adoptions and Becky and Karen T. about WW2 transcriptions as they are now primarily focused on card uploading until Christmas. The database will not be completely uploaded by our November 11, 2014 target date, but we are hoping to be able to share a good selection of them by mid-November. When we get closer to Remembrance Day, I’ll post the link to the collection in our online database. I do hope that all of our Soldier Card Project volunteers will be able to join us on Tuesday November 18th for a special event that will happen prior to Geoff Hayes’ talk on Waterloo County Soldiers in World War 1. An invitation will be going out to SIC project volunteers by email later this week. 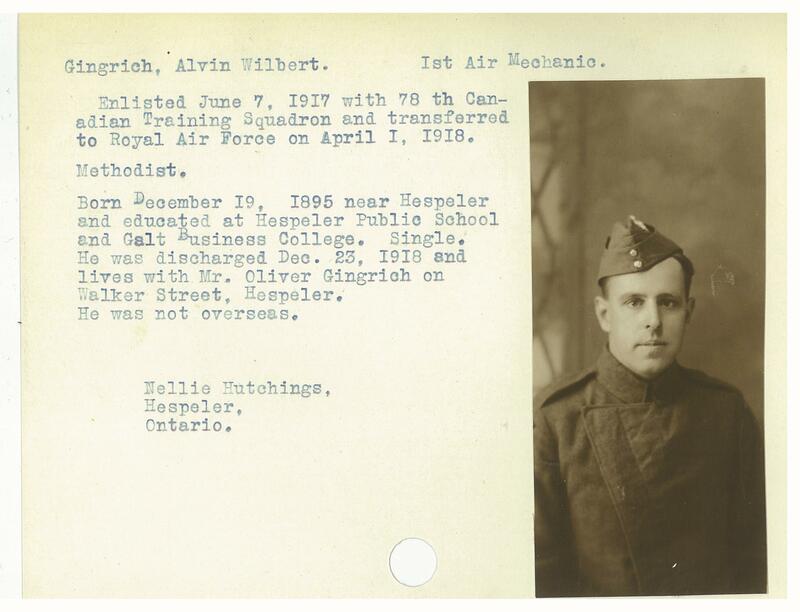 Soldier Information Card for Alvin Wilbert Gingrich of Hespeler, Ont. As the summer reaches its midpoint, I wanted to update everyone on the Soldier Card Project. It’s been bit of a roller-coaster ride for the past 6 months with the closure, move and re-opening of the Central Library. Although the blog has been quiet for a while, we are still plugging away on the Soldier Card Project while unpacking and shelving books and almost 50 skids of archival boxes and newspapers, answering reference questions and learning how to operate our new digital microfilm scanner in the Grace Schmidt Room. Currently, all of the WWI cards that required transcription have been completed. Volunteers are still researching and writing biographies and it looks like this process will be ongoing for the foreseeable future. Ingrid and Meg are looking after the circulation of cards for research. 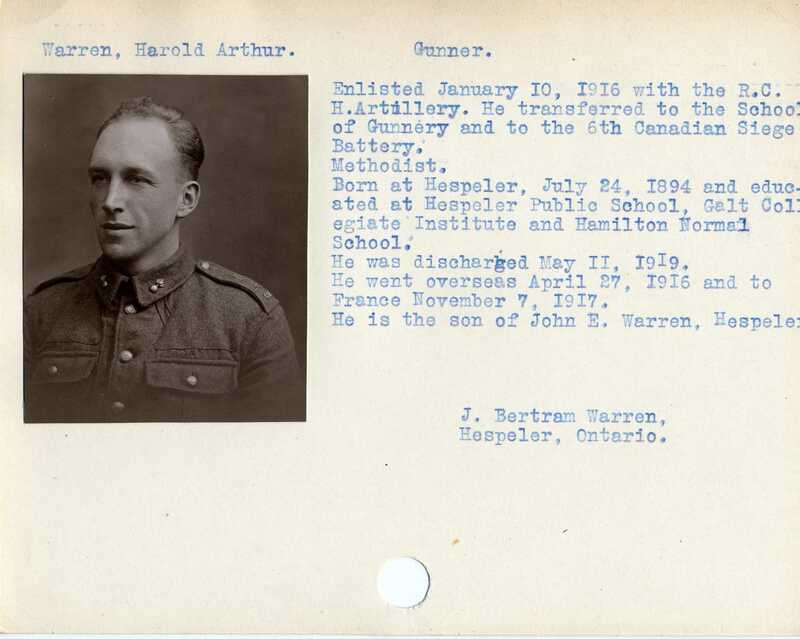 I have been working on finalizing instructions for staff to begin the upload of transcribed and researched WWI soldier cards to our online site, Our Digital World (formerly Our Ontario.ca). As luck would have it, Our Digital World started a major software upgrade and record indexing project during the last week of July, which should finish by Wednesday this week. Once the dust has settled on the updates to the service, we’ll begin uploading the cards, transcriptions and biographies. I’ll post a link to the collection to let everyone know where they can find the records. We are still circulating WWII soldier cards for transcription. Karen T. and Becky are looking after the circulation of these cards. We are approaching the alphabetical midpoint of the list, but the thick letters (M, P, S, T) are on the horizon. Another Karen, in this case, Karen S., has been rehousing the Soldier Cards in acid-free folders and boxes, carefully interleaving acid-free tissue between the cards to prevent damage. The original cards will be kept in our Archives and access to the collection will be made via the digital images and the online collection. There have also been a lot of work going on with the Waterloo Region Record. I am sure that you have been reading their fascinating WWI retrospective and soldier profiles – the photos for which are coming from the collections of the Grace Schmidt Room. It’s been an honour assisting Jeff Outhit, Luisa D’Amato and Rod Frketich at the Record with their research and photograph requests. So onward and upward (in a software kind of way) with the Soldier Card Project! We really do appreciate all that you have been doing. If you have a question, please don’t hesitate to contact me. This week, the Kitchener Public Library is celebrating National Volunteer Week, April 6-12, 2014, a time to recognize and cherish Canada’s 13.3 million volunteers. I wanted to give a shout-out to our nearly 120 Soldier Card Project volunteers, without whom this project would not be possible. To our amazing volunteers, thank you! Your stories of connection and resourcefulness continue to enrich the project. Everyday, your endeavours bring us closer to a fuller understanding of Waterloo County’s contribution to Canada’s military actions in the world wars. Our project has been profiled in the media (The Record, Kitchener Post, CTV News, Gary Doyle Show on News570). We were honoured to have Andrea Bellemare of CBC KW do the first soldier biography (http://www.cbc.ca/news/canada/kitchener-waterloo/kitchener-library-wants-you-to-adopt-wwi-soldiers-1.2491598), along with an on-air interview with Craig Norris about the project on 15 January 2014. 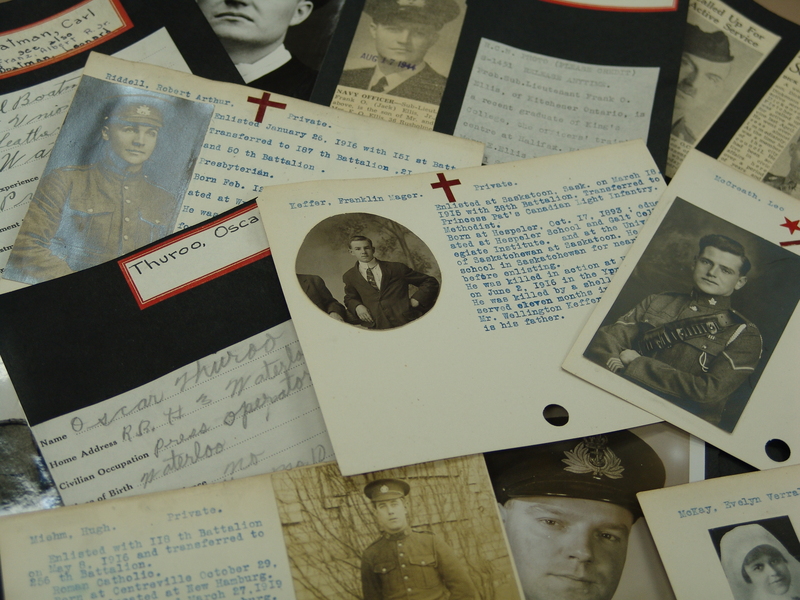 We’ve connected with volunteers from across the US and Canada and have had numerous offers of information and photos about local soldiers for our files. Currently, we have almost 90 volunteers transcribing cards and more who will be joining us for the research portion of the project. It’s been a daunting task keeping up with 90 transcribers – thanks to everyone for being patient and understanding. I’ve literally not seen my desktop for months, but am now feeling more settled as the inventory and scanning phases of the project are almost done. 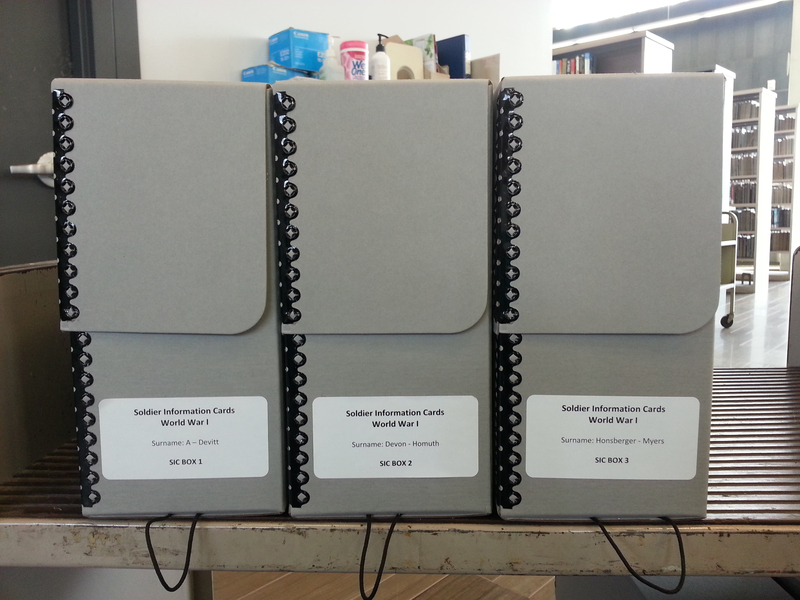 Over 2100 World War I cards designated for transcription have been distributed to our transcription volunteers. Scanning of the WWI card collection has been completed. We expect the WWII cards to be scanned by the end of February. As the cards return, the cards are rehoused in acid-free folders and boxes by Information Services staff for safekeeping. What’s up next? We’ll start sending out WWII cards for transcription and the WWI soldiers for research/biographies in early February. And, we’ll begin the upload of cards, transcriptions and biographies and start the cataloguing of the collection on our online site (details of which will be featured in later update on the project). Our goal is to have the complete WWI collection online by the end of August 2014. All of this could not be done without the support and diligence of the project’s dedicated and passionate volunteers and many wonderful people here at KPL. Personally, I’d like to thank Sherry Erb, Liana Kreamer and my colleagues in Information Services – Ingrid, Valerie, and Karen. It’s been a lot of work, but immensely satisfying, knowing that the project has brought together a whole community of people who are working to honour the contribution of our military in Waterloo Region. Many of our volunteers tell me in our email exchanges that they have been touched by the soldiers’ stories as they transcribe them. I hope that you’ll continue to let me know interesting finds and personal connections to the collection. Those stories make my day. This Tuesday, after the madness of Black Friday and Cyber Monday, is Giving Tuesday in Canada, a “opening day of the giving season, when everyone can share commitments, rally for favourite causes and think about others” (from the GivingTuesday website). For me, it is a really timely moment of reflection as we begin our Soldier Information Card Project in the Grace Schmidt Room. I am truly grateful for the over 80 volunteers who have pledged their time, effort and support in getting our Soldier Information Card project off the ground. I am in awe of their generosity, commitment and sense of community in helping the Library honour the lives of the military service people of Waterloo County. To our project volunteers, I say ‘thank you’. You are are the heart of the Grace Schmidt Room.